1 Preston G. Pysh Famous Sayings, Quotes and Quotation. 1. Investors give fund managers money at the wrong time. 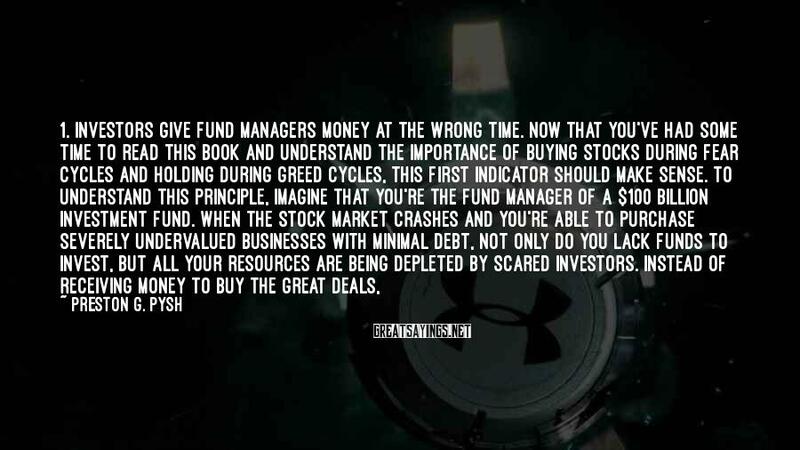 Now that you've had some time to read this book and understand the importance of buying stocks during fear cycles and holding during greed cycles, this first indicator should make sense. To understand this principle, imagine that you're the fund manager of a $100 billion investment fund. When the stock market crashes and you're able to purchase severely undervalued businesses with minimal debt, not only do you lack funds to invest, but all your resources are being depleted by scared investors. Instead of receiving money to buy the great deals, your investors are selling their shares in the fund and you don't have the capacity to take advantage of the market behavior. This reason alone severely handicaps fund managers as they attempt to beat the market.